Bayan'obo Mining District, (Mongolian: ᠪᠠᠶᠠᠨ ᠣᠪᠣᠭ᠋᠎ᠠ ᠠᠭᠤᠷᠬᠠᠢ ᠶᠢᠨ ᠲᠣᠭᠣᠷᠢᠭ Bayan Oboɣ-a Aɣurqai-yin toɣoriɣ, Баян-Овоо Уурхайн тойрог (Mongolian: "rich" + ovoo); simplified Chinese: 白云鄂博矿区; traditional Chinese: 白雲鄂博礦區; pinyin: Báiyúnèbó Kuàng Qū), or Baiyun-Obo or Baiyun'ebo, is a mining town in the west of Inner Mongolia, People's Republic of China. 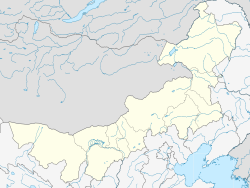 It is under the administration of Baotou City, the downtown of which is more than 120 kilometres (75 mi) to the south. The mines north of the town are the largest deposits of rare-earth metals yet found and, as of 2005, responsible for 45% of global rare-earth metal production. In the satellite image at right, vegetation appears red, grassland is light brown, rocks are black, and water surfaces are green. Two circular open-pit mines are visible, as well as a number of tailings ponds and tailings piles. China produced about 81,000 tons of rare-earth metals in 2001; the number jumped to about 120,000 by 2006. According to the Chinese Society of Rare Earths, 9,600 to 12,000 cubic metres (340,000 to 420,000 cubic feet) of waste gas—containing dust concentrate, hydrofluoric acid, sulfur dioxide, and sulfuric acid—are released with every ton of rare metals that are mined. Approximately 75 m3 (2,600 cu ft) of acidic wastewater, plus about a ton of radioactive waste residue are also produced. Very large rare-earth elements (REE) Fe-Nb deposit (Bayan-Obo type), discovered as an iron deposit in 1927. REE minerals were discovered in 1936, and niobium-bearing ores in the late 1950s. Reserves are estimated at more than 40 million tons of REE minerals grading at 3-5.4% REE (70% of world's known REE reserves), 1 million tons of Nb2O5 and 470 million tons of iron. The deposit also contains an estimated 130 million tons of fluorite. Bayon Obo is the world's largest known REE deposit. The fluorite content of the ores also makes it the world's largest fluorite deposit. The deposit occurs in an east-west trending Mesoproterozoic rift zone along the northern margin of the Sino-Korean Craton. Host strata are quartzite, slate, limestone, and dolomite. Dolomite is the main host rock. The orebodies are stratiform and lenticular, with masses, bands, layers, veins, and disseminations. Besides clear features of hydrothermal mineralization, the deposit also exhibits Mg, Fe, Na and F metasomatism. Sm-Nd monazite isochron age for bastnaesite and riebeckite is 1200 to 1300 Ma, whereas Th-Pb and Sm-Nd age of Ba-REE-F carbonates and aeschynite is 474 to 402 Ma. ^ Lawrence J. Drewa, Meng Qingrunb and Sun Weijun (1990). "The Bayan Obo iron-rare-earth-niobium deposits, Inner Mongolia, China". Lithos. 26 (1–2): 43–65. doi:10.1016/0024-4937(90)90040-8. ^ Xue-Ming Yang, Michael J. Le Bas (2004). "Chemical compositions of carbonate minerals from Bayan Obo, Inner Mongolia, China: implications for petrogenesis". Lithos. 72 (1–2): 97–116. doi:10.1016/j.lithos.2003.09.002.